This entry was posted in Training & education on 2017/11/22 by Susan. Large trucks need much more room to stop and to turn than passenger vehicles. They have many blind spots. Leave space to stay safe when sharing the road. 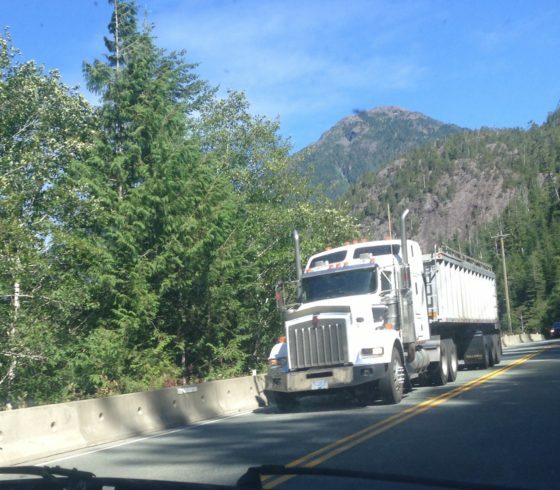 Driving the narrow, winding highway to and from Tofino this past summer, I saw passenger vehicles making stupid, careless moves around big rigs. One of the worst was drivers passing big trucks, then merging immediately in front of them. So I’m writing this post to say: Come on, drivers! You can do better! Each year in B.C., about 60 people are killed in traffic crashes involving large commercial vehicles. This information comes from the Be Truck Aware Alliance, a coalition of B.C. road safety stakeholders. “Studies show that, in collisions between cars and large trucks, the occupants of the passenger vehicle are at least four times more likely to be killed than the driver of the truck,” reads the overview of an initiative from the government of B.C., which highlights how important it is for the drivers of both cars and trucks to share the road and follow safe driving practices. Give trucks lots of space. Be visible around trucks – trucks have blind spots. Make way for trucks changing lanes. Ensure brakes and tires are in top condition to minimize stopping distances. Adjust speed and driving in poor weather and road conditions. Stay sharp and focused by getting plenty of rest and eliminating in-cab distractions. Make sure loads are well-balanced and secure to reduce the likelihood of a crash and its impact on others. Be sure to watch the dashcam videos. You can also read about what it’s like to drive a big rig in this story from Coquitlam Tri-City News, Coquitlam truckers support safe driving campaign. The bottom line for me is this: You might be in a hurry, but if you drive unsafely, you could end up dead – which is a lot worse than being late.